I was angry (still am), but now I’m also embarrassed | A balanced diet . . . Embarrassed . . . to be British. 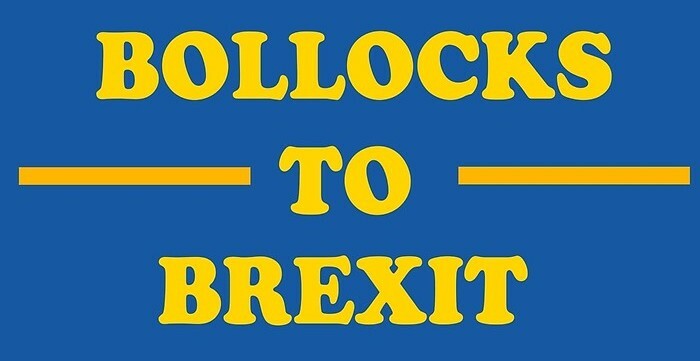 But come autumn 2019, however, I’ll be able to thumb my nose at the world with my new iconic blue and gold passport (to be manufactured, apparently, in France – oh the irony!). Even though I might not be able to visit as many countries, visa-free, as UK citizens currently enjoy under membership of the European Union (EU). Let’s go back a couple of years. I woke up on the morning of Friday 24 June 2016 and, as was my wont, tuned into BBC Radio 4’s Today news program at 06:00. I say ‘wont’ because I seldom listen nowadays. But more of that later. I was keen to hear the result of the previous day’s referendum on continuing membership of the EU, expecting a majority in favor. How cruel reality can be! I was amazed, bewildered, dismayed even, when the result sank in. The nation was divided, voting 52-48% (a difference of 1,269,501 votes on a turnout of 72.2%) to leave the EU. Brexit was now on the cards. Or was it? I just couldn’t believe that the electorate had turned its back on an institution it had been part of, and benefited from, for over 40 years. Leave supporters had swallowed the false promises, mistruths, downright lies even (and, as we now know, the illegality) of the Leave campaign. But since the referendum was not legally binding (just check the legislation that gave substance to the referendum) I thought (misguidedly as it has transpired) everyone would come their senses and reach a suitable compromise, allowing us to stay in the EU. However, the ‘will of the people’ has become almost an article of faith that cannot (may not), under any circumstances if you are a Brexiteer, be challenged. I’ve long argued that since the referendum would potentially have far-reaching social, economic, and constitutional consequences, the bar should have been set much higher. By this I mean that a minimum voter turnout must have been reached, e.g. 75%, and that the margin voting to Leave should have been >50% of the electorate, not just those who voted. I guess I can be accused of wanting it both ways: heads I win, tails you lose. But the referendum was to decide a fundamental transformation of this (once proud) nation. So, if the voter turnout did not meet the agreed threshold, or less than 50% of the electorate (22,750,063 in June 2016) voted to leave, then the referendum would have been declared null and void. That, unfortunately was not the case, because former Prime Minister David Cameron was too complacent during the whole referendum campaign and the lead up to its implementation. Holding a referendum on the UK’s membership of the EU was a political sop to the right wing of the Conservative Party. He never imagined that he would have to contend with the likes of Boris Johnson and Michael Gove on the Leave side, never mind Nigel Farage of UKIP, who had few if any scruples about telling like it wasn’t. And he expected to win. Having lost, he bowed out of politics leaving the consequences for an even more incompetent Prime Minister to address. It didn’t take long for my dismay to turn to anger. But now I’m also embarrassed. Embarrassed by the complete shambles (I could use stronger language) of the way that Theresa May’s inept (but ostensibly ‘stable and strong’) government has attempted to reflect the ‘will of the British people’ in a withdrawal agreement with and from the EU, and establish a new relationship post-Brexit. The UK has become a laughing stock among the nations of the world. We are on a trajectory to becoming an irrelevant little island off the coast of Europe. Under those circumstances, can (should?) the UK still lay claim, for example, to a permanent seat on the United Nations Security Council? Its status will be diminished. Yes, for many, the UK will become an irrelevance. I say ‘attempted to reflect’ because almost 2½ years on from the referendum, we still seem to have no idea of what the UK’s post-Brexit status will be. Given the growing prospect that no deal is agreed by the Brexit date (29 March 2019, just five months away), the government apparently has no plan, but has started to publish grim impact papers of what a no deal or hard Brexit would encompass. But ask any of the Brexiteers what their reaction is (more of ‘Project Fear’) or their plan, and you are faced with the same old platitudes: we’re taking back control of our borders, money, and laws. Hang the economic, social and constitutional consequences. What a parlous state we have reached. All I can assume is that when Theresa May invoked Article 50 on 29 March 2017 (triggering the process to leave the EU), she thought that any agreement with the EU would be done and dusted in a matter of weeks. In fact, former Secretary of State for Exiting the European Union, David Davis (now there’s a clown of a politician if ever I saw one), stated that this agreement would be one of the easiest to achieve. From Twitter on 19 June 2018: Robert Campbell #FBPE Deeply Unhelpful @madman2. David Davis with EU Chief Negotiator Michel Barnier. Theresa May didn’t have to invoke Article 50 in March 2017, but she did. And we were then locked into a situation that seems to be heading for failure. She must have assumed that the EU members would simply accede to any of the ‘having our cake and eat it’ proposals put forward by the British government. In fact, I’m surprised that the other 27 members hadn’t shown the door to the British a long time ago. It seems to me that Brexiteers feel the EU owes us something. Nonsense! We’re the ones asking to leave; or at least some of us are (don’t count me among them). It’s been made crystal clear that the UK’s relationship with the EU post-Brexit cannot be equal to what we currently enjoy as full members: frictionless trade, freedom of movement, and the like. Indeed as a ‘third country’ post-Brexit, we will be at a serious disadvantage, and all those trade and other agreements that the UK participates in as a member of the EU will have to be renegotiated, one by one. A Canada +++ agreement to fill the void? Canada +++, my backside! Brexiteers simply talk about an independent UK outside the EU in terms of trade, and their desire to negotiate free trade agreements (FTA) on our own terms, notwithstanding that we already have FTAs with more than 60 counties or blocks of countries through membership of the EU. At 11 pm on 29 March next we lose all of those. Brexiteers object to the role of the European Court of Justice overseeing the EU’s regulatory framework. But even operating under the rules of the World Trade Organization we will still be subject to the authority of that body, and trading under far less favorable conditions than at present. It doesn’t take Economics 101 to see that. But at least our Secretary of State for International Trade will be able to travel globally on his new blue passport to negotiate all those trade deals that he assures us are just waiting to be signed. Membership of the EU has brought so much more. For one thing, the EU has, among its members ensured peace in Europe over many decades. Joint membership of the EU by the UK and Republic of Ireland is one of the principles of the Good Friday Agreement. The future of the border between Northern Ireland and the Republic is one of the main stumbling blocks of further progress in the withdrawal agreement, as it was long foreseen by many on the Remain side but discounted by Brexiteers, chief among them Boris Johnson and Jacob Rees-Mogg. In the early 2000s, when I was working at IRRI in the Philippines, risk assessment was one of the conditions insisted upon by the donors to the international agricultural research centers to continue receiving overseas development assistance support. It’s ironic that the UK government, through the Department for International Development, DFID, was one of the leading proponents of such conditions. And clearly, as far as Brexit is concerned, the government does not appear to have made an appropriate risk assessment or developed a contingency plan. Or if it has, it’s not telling anyone. I still live in some hope that a #PeoplesVote will be held to pass judgment on any agreement that the government brings back from Brussels, and that one of the options would be to remain in the EU. But I’m not holding my breath. Once the bastion of impartiality and independent journalism, the BBC is now perceived as taking a very partisan, pro-government stance on Brexit. For a long time now I have deplored the presenting and interviewing style of the program’s senior broadcaster, John Humphrys. Not only does he come across as a self-opinionated bully, but also as favoring one side (i.e. Brexit) over another in his interviews, often lacking a basic understanding of the issues. It’s time for Humphrys to be superannuated. This entry was posted in In the news, On my mind . . . and tagged Brexit, EU.